As Vertigo works on its line-up and changing its image a bit, it will be interesting to see how monthly issues will end up adapting. In these mini reviews we tried to stay current on books that you will be reading from Vertigo, though on the higher numbered issues it can be difficult to decode them if you havn’t read up to that point. These are a few of the most current comics available from Vertigo and will be a part of what will define Vertigo through the rest of 2015. This miniseries is adapted from the Fables videogame of the same name, the plot of which was constructed with close supervision of series creator Bill Willingham. The miniseries is actually going to stand as the last piece produced in the Fables universe for Vertigo, running for a full year. The series is actually a digital-first production that comes out weekly, with shorter little section coming out each week and the physical issue actually standing longer than your average comic issue. The series plays a lot better in these shorter weekly snapshots, in part because the comic is so text heavy and is dense to read. While the writing from Matthew Sturges and Dave Juantus is solid, it does not have the fun and interest that regular Fables stories does. The dialogue gets long winded and tiresome, and the murder mystery itself lacks a little weight. This does not make the series too difficult, especially for long-standing fables fans, but it certainly does not have the flair that you would expect. Each issue has multiple artists, which is hit and miss, but in issue #6 this is actually a stronger point. The flash-backs from Bigby to his time just before the Salem Witch Trials is one of the more interesting interludes, but it again moves a little too slowly with too much wasted dialogue. This may not be the best corner of Vertigo right now, but for those of us in love with Fables and heartbroken by its conclusion, this is a way to stay connected. It is also a very positive functional step forward for the digital production at Vertigo. This is the conclusion of the four issue miniseries that takes the weird Strange Sports Stories concept from DC’s silver age and gives it a twist, which is the kind of idea that Vertigo was founded on. In this issue you see several one-shot stories, usually telling a sports or competition related tale with a twist towards the end. Throughout the series the stories have been hit and miss, and this is one of the stronger issues from its run. The opening story about falcon training is horrorfying, and the final story from Paul Pope is a real treat for fans. None of these little snapshots are going to really stand out too far from its first reading, but it does have the feel of a fun anthology that prides itself on its weirdness. What it should not pride itself on is its $4.99 price tag, which really isn’t justified. 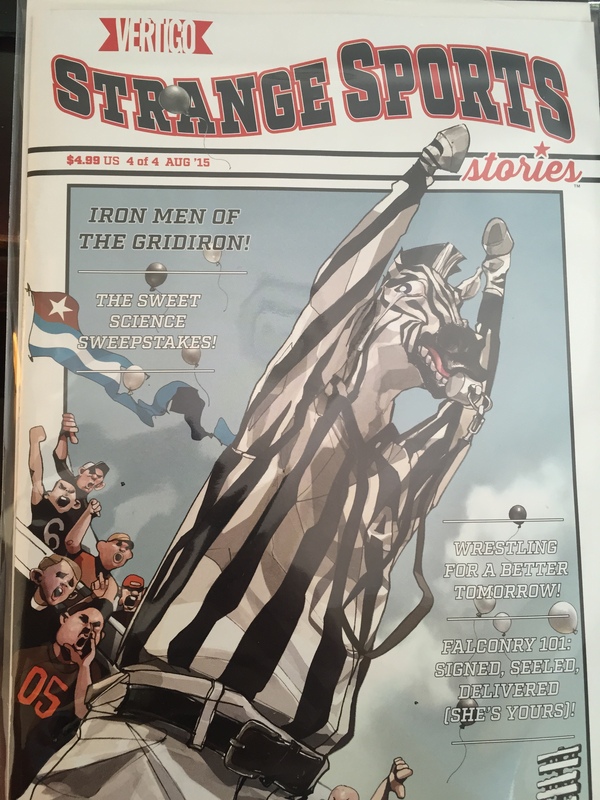 It is understandable when Vertigo Quarterly rings in at $7.99 because of the size and production quality of the book itself, but Strange Sports Stories is really more in line with an average comic in terms of size and design. Either way, it is really nice seeing Vertigo bringing back the Anthology format even though they are never the top sellers, and this is a great inclusion into their new canon. FBP has been one of the most consistently solid comics in the recent run of Vertigo, even though it has only maintained a relatively small audience. Following the exploits of a government agency, and specifically their special agent Adam Hardy, who are trying to solve breaks in the laws of physics. The art from Alberto Ponticelli, and the color by Michael E. Wiggam, is wild and viceral, dropping you right into a world where gravity is moving sideways or singularities are heading to the middle of main street. The current arc is getting a little confusing as there are multiple dimensions present during the crisis, and this brings up one of the bigger issues with both this book and a lot of other Vertigo books. While it still reads well month to month, it is clear that storylines are being written all in one swoop. This often creates great writing, but it can make it confusing to readers when they have a month gap. A great way to solve this would be to have little summary pages in the front to get readers back up to speed. Either way, this is a series to continue with, but I certainly wouldn’t jump in on this issue.